The idea is to create a self-perpetuating blog that will publish repeatedly based on the incoming alert feed. The project attempts to question the utility of these automated systems such as “Google Alerts” and how they are being used to aggregate and polarize opinions on the Internet. I wonder if other blogs can get in this loop by writing about it (such as this post) / using a trackback? 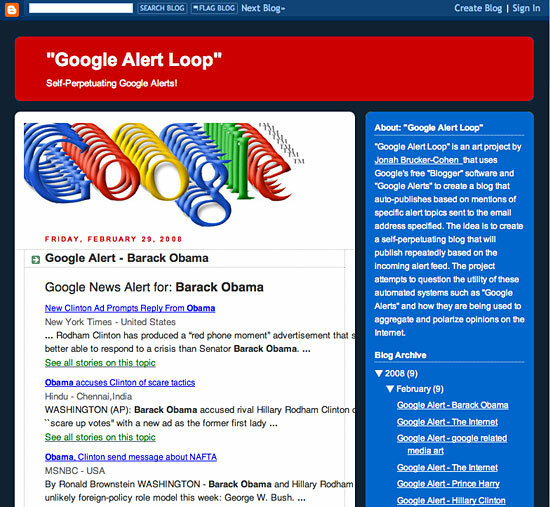 Google Alert Loop has an amazing logo!